The Ergo Chef/Michael Symon 11pc Set – with a 10 Slot Block Cutlery Set feature full tang construction, extremely durable G10 Fiberglass Resin Handles, and beautifully grounded German Steel blades with 18 degree cutting edges for smooth slices through all your food product. This set is custom assembled with Michael Symon’s Cutlery and an Ergo Chef’s 10 Slot Knife Block, Kitchen Shears and 10″ Diamond Sharpener. The set features the Michael Symon Cutlery and include his forged 9″ Chef knife, 6″ Chef knife, 6″ Serrated Utility knife, 3.5″ Paring knife and 4 serrated steak knives. The knives feature extremely durable G10 handles finished with 2 stainless steel rivets, and a full tang and bolster, all high polished for lasting beauty. The blades are precision ground from German Made carbon steel and the straight edges are sharpened to 18 degree per side for perfect slices every time. The serrated edges are single sided bevel cut into our wider D shape for smooth cuts in all your proteins. All the knives are good for both right & left handed people. Michael Symon’s Knives: 9″ Chef, 6″ Chef, 6″ Utility, 3.5″ Paring & 4 – 4.75″ Steak knives. Care: Hand wash with soft sponge & dish soap or comet cleanser. Towel dry and store in block. Always use wood, bamboo or plastic cutting boards. NEVER use glass, stainless steel or Counter tops to cut as they can dull knives and damage the edges. 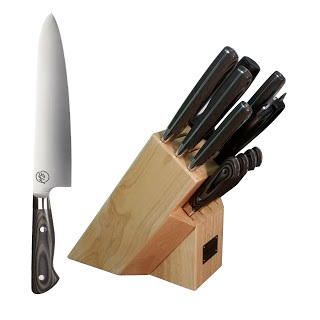 Ergo Chef is having a huge closeout savings for this high quality knife line. There is nothing better when two giants come together to bring you a amazing giveaway. Chew” and visit his website with the link provided below. Holiday Contest and Sweeps Did not receive any compensation for this giveaway. directly to the winner.Please allow two week for processing and shipping. Previous post: Enchantails Mermaid Giveaway!